Dental fluorosis is an irreversible condition caused by excessive ingestion of fluoride during the tooth forming years. It is the first visible sign of overexposure to fluoride. Fluorides are slightly more toxic than lead, and slightly less toxic than arsenic. The California Code of Regulations, title 22 lists 791 chemicals as "Hazardous Waste." 39 of these are fluoride compounds. Two are used for drinking water fluoridation in Sacramento CA. According to Section 20 of the American Dental Association Code of Ethics , "Dentists' non-participation [in fluoridation promotion] is overt neglect of professional responsibility." In recent years, several dentists who have testified on the anti-fluoridation side have been reprimanded by their state dental officers. If a dentist speaks out against fluoridation, he could lose his license. This is professional and scientific censorship. It's also impossible to discuss or debate any ADA member. They simply refuse to attend any town debate where fluoridation is the topic. Their strategy is not to expose the subject to common sense. When open minded people hear both sides, the ADA's arguments fall flat and fluoridation fails. The California Board of Dental Examiners, in the following letter, states that the dental community has had no professional training on the subject of ingested fluoride (rather than topically applied fluoride, such as toothpaste). Dentists who are attempting to persuade opinion and speak in the capacity of a dental professional are acting beyond the scope of their profession to say ingested fluoride is "safe". It's the same as a podiatrist (foot doctor) giving his professional opinion on your upcoming heart surgery. He's simply not qualified to state a professional opinion since he has no training in this area. They would be practicing medicine without a license. The significance of this answer should be apparent to those individuals who have seen local dentists, as well as national spokespersons with dental licenses, offer their credentials as a dentist as proof that they possess expertise on the subject of whether adverse health effects do or do not occur, or may or may not occur, as a result of exposure to ingested fluoride. Citizens for Safe Drinking Water and other groups throughout the nation have informed deliberative bodies such as city councils and water boards, as well as the media, of the fact that the dental community has had no professional training on the subject of ingested fluoride (rather than topically applied fluoride, such as toothpaste), much less continuing education to keep the industry or its members abreast of new scientific studies and risk assessments. This statement confirms that position and once again reinforces that the subject matter of fluoridation is rightfully one of the appropriate use of the public water supply, and the impact of mass medication on the entire body, rather than children's teeth and blanket denials of any possible adverse effects from uninformed special interests. This letter from the Board of Dental Examiners follows on the heels of their December 3, 1999 hearing at which Citizens for Safe Drinking Water informed the Board that they should expect to see more consumer complaints from citizens against dentists who willingly use their professional standing to lend credibility to selling industrial hazardous waste fluoride while claiming that they are experts on the subject, when in fact they have no accredited training or professional license to diagnose outside of the oral cavity. The Board of Dental Examiners had previously disapproved continuing education credits for a symposium on the risk assessment of ingested fluoride on the grounds that the subject matter did not apply to the practice of dentistry. One might ask the question: what does it take to motivate a local dentist to publicly challenge the ongoing effort to fluoridate the Watsonville community? Easy answer: the truth, an element still missing from the public forum. "The truth is incontrovertible," Winston Churchill once claimed, "malice may attack it, ignorance deride it, but in the end, there it is." Such is the case here. Contrary to the Sentinel's assertions of safety, water fluoridation has been found to be associated with increased incidence of hip fracture, bone cancer and reduced IQ in children. Other neurological impairments have been noted, including ADD and ADHD. Recognizing fluoride's powerful impact on human biochemistry, even the American Dental Association and the American Academy of Pediatrics agree that babies less than 6 months old should not receive any fluoride, yet formulas and baths will soon be fluoride-laden if the state has its way. How will busy parents of newborns find the time, energy, money and education necessary to protect the health of their children? What will happen to all of us at the other end of the age spectrum when every city in the USA is fluoridated? Why do we proceed down this dangerous path, knowing that adding fluoride to the community water supply will not halt dental decay? Collectively analyzed, studies comparing decay rates in fluoridated vs. non-fluoridated communities have routinely shown conflicting results. Numerous un-fluoridated cities have demonstrated lower decay rates than comparable fluoridated communities so something else must be responsible. What might that be? Poverty and ignorance. Poverty and ignorance are the culprits responsible for rampant dental decay, not the lack of fluoride in the water. That's where our efforts should be directed, not toward mass medicating the entire population in order to serve a few. Education, education, and more education on oral hygiene, diet, and habits, along with easier access to preventive care, are the ultimate solutions. Looking at the bigger picture here from a completely different perspective, the California Dental Association Foundation is bullying an unwilling community with a state law they created. Moreover, the dental community has been denied access to the education necessary to evaluate the claims that fluoride in general, and community water fluoridation is harmful. A 2½ day course I attended in 1998 regarding these issues had the continuing education units rescinded and denied by the UCSD School of Medicine and the California Board of Dental Examiners, respectively, reducing attendance from hundreds to less than 20. Shortly afterwards, as a long time board member of the Monterey Bay Dental Society, I proposed inviting David Kennedy, D.D.S. to give our local dentists a lecture on water fluoridation. The Board president informed me at the subsequent meeting that we, the Monterey Bay Dental Society, could not entertain an opposing view to water fluoridation because we were members of the American Dental Association and California Dental Association, who were staunch proponents of water fluoridation. Dentists have been denied the education necessary to make a truly informed opinion regarding fluoride and community water fluoridation. They simply do not know the truth. Altruistic in aim, misguided in direction, led by many of our nations finest servants, the dental profession has been ambling down the wrong path. It is time to correct our direction from mass medication to mass education. David Biles has practiced dentistry in Santa Cruz for 25 years and held positions as the Legislative chair, newsletter editor, and CalDPac representative for the Monterey Bay Dental Society from the early 1990s until 2003.
a) that in 2005, 4 years following the release of the CDC's sentinel recommendations, a considerable proportion of dental professionals in Indiana still did not understand fluoride's predominant mode of action." Not only were the dentists behind in their knowledge of fluoride research, but the survey also found they didn't even know basic information about fluoride, such as how much fluoride is in toothpaste or high-fluoride gels. b) As noted by the authors: "Another important finding was the inability of respondents to correctly identify the concentration of commonly used fluoride products." This raises the question: If, after 60 years of water fluoridation, most dentists still don’t know how fluoride actually works, or how much fluoride is in the products they prescribe, what else do they not know? Do they know how fluoride affects other tissues in the body besides the teeth? REFERENCE: Yoder KM, et al. (2007). Knowledge and use of fluoride among Indiana dental professionals. Journal of Public Health Dentistry 67(3):140-7. More fluoride = more money for dentists? Dentists pat themselves on the back claiming they are the only profession endorsing something that would put them out of business. But apparently the more fluoride people get, the more money dentists make. How many decades did we hear from the scientists who worked for industry that cigarettes weren't addictive, even in the face of mounting research. No one died after smoking one cigarette, or one pack, or one carton but after twenty years, cancers started to "mysteriously" appear. We were told these deaths were unrelated to smoking. New science revealed the mystery. The American Cancer Society states the "During 1995, approximately 2.1 million people in developed countries died as a result of smoking. Tobacco use is responsible for nearly one in five deaths in the United States. But it was 100% safe just a few years ago. In the 1950's, 19,293 dentists advised us that smoking was o.k. - we're professionals, trust us. Earlier scientists for the government approved DDT was safe and effective. Around that same time water fluoridation was also said to be safe. 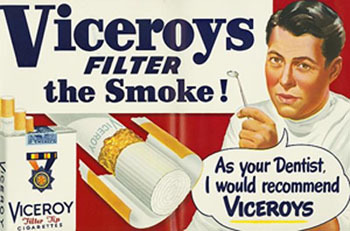 Mainstream scientists were wrong about tobacco and DDT. Scientists and government agencies approved a variety of chemicals and drugs and told us they were extensively tested and were safe. They include asbestos, DDT (pesticide), PCB (industrial chemical ), Lead (paint and gasoline additive), MTBE (gasoline additive), Dioxin (pesticide), Agent Orange (defoliant), Dalkon shield (contraceptive), Thalidomide (pregnancy anti nausea drug). You be the judge as to how safe fluoride it is for your children and families - that's the only sensible thing to do, after all, you betting their long term health.